Boxing at the Jewish Community Center gets you results! Each class provides a combination of traditional boxing, kickboxing and body weight exercises to create the highest intensity workouts, to achieve maximum results. You get an inspiring "extra" with boxing at the J by building a strong relationship with fellow boxing enthusiasts and trainers alike. Each trainer caters to the needs of both the group as a whole and the individuals making up the group, creating the optimal environment for both physical and mental growth within the program and to impact life outside of boxing too. No matter your fitness level, we have the class for you. How bad do you want it? Boxing is now FREE with your J Membership! Click here to view the Group Exercise Schedule. J Box Gets You Results! What are the benefits of a boxing workout? This start-stop style of exercise is referred to as interval training. Interval training involves alternating between high-intensity and low-intensity work with shorts periods of rest intermixed to increase cardiovascular fitness. There are many health benefits of boxing for cardiovascular health including reduced risk of heart disease, reduced blood pressure and reduced risk of stroke. Boxing style training including hitting a heavy bag, doing pad work and working the speed ball provide a good outlet for stress. Intense exercise triggers the release of feel-good hormones called endorphins, which leave you feeling happy, confident and less stressed. Bone mass normally peaks when you are in your mid-30s to late 30s and then, if left unchecked, gradually declines as you age. Weight-bearing exercise and exercises that place a significant load through your bones can reduce bone loss and may even result in increased bone mass. If left untreated, low bone mass may develop into a serious medical condition called osteoporosis, which is normally associated with bones that fracture easily. As boxing loads all of your major bones, it can help prevent bone loss. Boxing training is an energetic activity that burns a lot of calories. This calorie-burning effect can help prevent a calorific surplus and help with weight maintenance or weight loss. A 130-pound person who performs a 30-minute session on a punching bag will burn around 175 calories, and the same person would burn around 260 sparring. 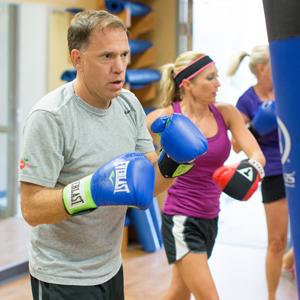 Combined with a calorie controlled diet, boxing training can help you maintain your ideal weight.